Google is discontinuing reader. I have changed the main blog aggregations to use yahoo pipes, and will do so for other feeds later. I may give updated instructions on this blog, though in the mean time it should be easy to use a feed combiner of your choice instead of google reader. I give no warranty that yahoo pipes will continue to be available, I could end up having to change again in the future! 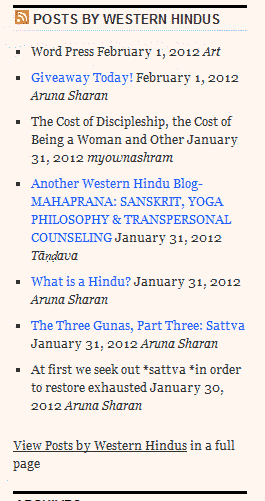 I have recently added a composite feed from a number of other blogs into the sidebar of my Hindu blog. I also created a page showing a summary of these items. To demonstrate how this was done I have decided to add (maybe temporarily) a feed of tips from a number of blogs on WordPress on my Tech blog. First, I will describe the concept. Like a lot of websites, WordPress blogs provide an RSS feed, which contains information about the latest posts. These can be put into the WordPress sidebar using the RSS Widget. 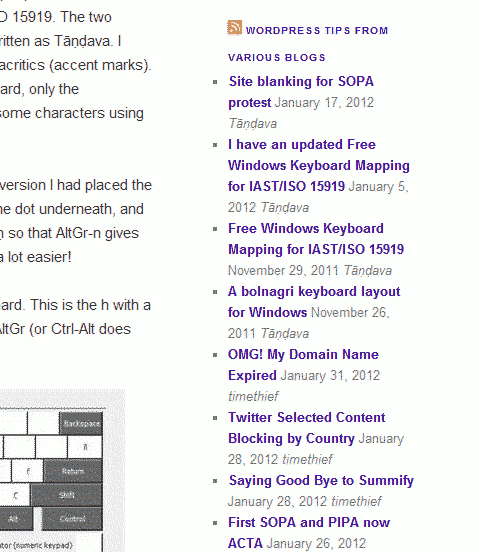 However to show the latest of several blogs in a single widget you need an RSS aggregator. There are several RSS aggregators, but I wanted one that would be around for a long time (how wrong I was!). After some research I discovered that Google Reader can aggregate RSS feeds. To create an aggregate feed in Google reader, subscribe first if you don’t use any google services. Next subscribe to the feeds you want to aggregate. Some browsers require a plugin to do this, but for most you go to the blog and click the RSS symbol, and this will give you the option of subscribing with google reader. These will show in your subscriptions. To create an aggregate we use the fairly well hidden option “create bundle”. To do this select “brows for stuff” then “create bundle”. This will open a page similar to the one below. 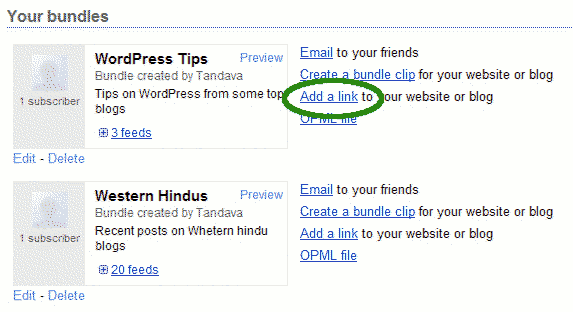 The aggregated feed is available by right-clicking the “atom feed” link and selecting “save link as”. Alternatively simply click the link and copy the link address from your browser’s URL bar. The resulting page can be seen here (I did a bit more tidying for the one on my Hindu site). If you want to link to the page in the WordPress sidebar, use a text widget. I did this on my Hindu site directly under the feed widget. This entry was posted in technical and tagged Combining RSS feeds, feed aggregation, Google Reader, RSS, showing multiple feeds, wordpress. Bookmark the permalink. Thanks for posting this – I am very interested in all the different ways you can use RSS aggregation and I didn’t realize you could create a separate feed from a bundle. 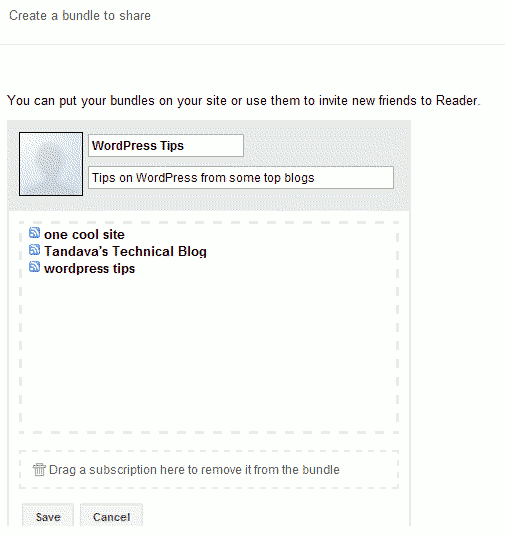 If you would like to aggregate multiple RSS feeds into a single feed in Google Reader, follow these instructions.